It was a beautiful day for it, so I took the opportunity to get down early to get a few external shots of the iconic building in context. Dublin doesn't have many publically accessible, elevated vantage points. 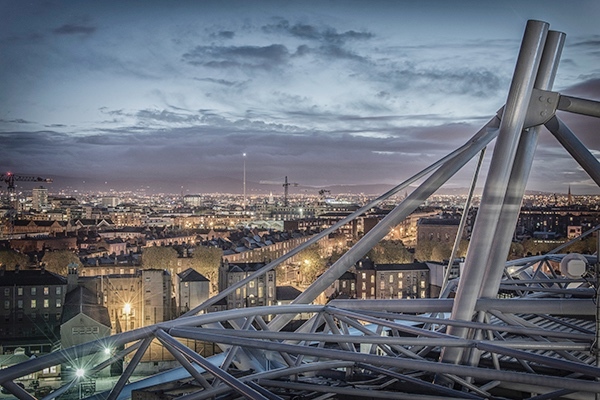 At 17 storeys up, this is Dublin's highest open-viewing platform, with amazing panoramic views over the city. At this stage I couldn't feel my fingers. That beautiful day had turned into a freezing evening...and in my wisdom, I forgot to bring my gloves. Rookie error. On my way out, as my finger's thawed, I got some last images of the Stadium itself. What a space. What drama has occurred within these walls. Victory and defeat in equal measure...dreams are made and destroyed every year on this pitch and in these stands. As a Cavan man, unfortunately I haven't got to cheer my county here too often...but our time will come. Just you wait and see. As an Irishman though, a visit here is always a visit to hallowed ground.